An aerial view of Naomi Campbell’s birthday gift ‘retreat home’ shaped in the form of the Eye of Horus. Well, the show stopped running some time ago, but one new house might just inspire a revival of the show. Because out of all the extravagant homes and lavish lifestyles of the rich and famous, this one house just might take the cake. 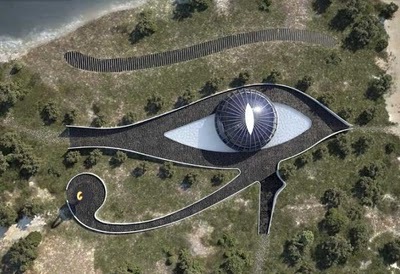 Naomi Campbell received one of the most lavish birthday gifts ever when her Russian billionaire boyfriend, Vladislav Doronin, decided to give her a “retreat home” shaped like the Eye of Horus. If you’re not familiar with Egyptian history, the short explanation is the Eye of Horus or Udjat eye (which is spelled many different ways) is a symbol of protection, completion, power and good health.